In a bid to get more PS3 owners to embrace the 3D gaming revolution, Sony unveiled its PlayStation branded 24-inch 3D-ready display at E3 last year. After initial delays, it's finally been made available to buy in the UK. Aside from its stereoscopic prowess, we give you ten snapshot reasons why you should be parting with your cash to grab the Sony PlayStation 3D display. A 24-inch, full-HD 1080p resolution screen and edge LED lighting technology ensure crisp visuals and an impressive contrast ratio. Active shutter tech and an integrated 3D transmitter deliver a devastatingly stereoscopic experience. On compatible games, SimulView enables two specs-wearing players to see their own individual, full-screen, feeds in 2D. You can connect it to a set-top box and choose whether to watch TV and movies in 3D or 2D. With two HDMIs, a component port and compatability with the PS3, 3D-ready PCs and other 3D consoles, it's a multi-dimensional hub. Covering your gaming audio, the built-in speakers and 5W subwoofer give games and movies serious audio clout. 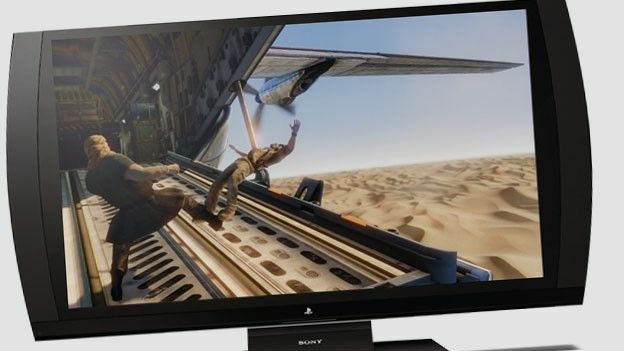 With a 240Hz refresh rate, the 3D telly should deliver smooth, lag-free PS3 gameplay and blur-free images when you are watching the telly. Using active shutter technology, you'll get one pair of the 3D specs in the box, but if you want more you will have to pay $69 each (UK £TBC). If you are planning to pick one up from Amazon or other confirmed retailers, the display will ship with a copy of Killzone 3 and Gran Turismo 5 for instant 3D action. Despite the pretty impressive specs on board, the PlayStation 3D monitor is one of the cheapest routes into 3D viewing to date.